The Clinton County Historical Association Presents: "Welcome to the Witherill Hotel"
Plattsburgh, N.Y. – The iconic Witherill Hotel, located in downtown Plattsburgh until 1969, was built 150 years ago this year. Susan Howell Hamlin, daughter of the late William Howell, former owner the Hotel, has compiled images and stories for the release of her book, Welcome to the Witherill: A retrospective on Plattsburgh¹s landmark hotel and the family who owned it. and operated the Senate Restaurant in the Washington, DC. Under the Howells, the Hotel expanded to almost 100 rooms before it closed in 1968. 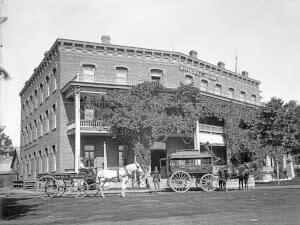 In 1936, Major Howell¹s son William, Jr. took over management of the Hotel. Relive your memories of the Witherill with Susan on Monday, August 20, 6:30 pm, at the Clinton County Historical Association, 98 Ohio Avenue, Old Base Museum Campus. Susan will share her memories and experiences being raised in one of Plattsburgh¹s most notable hotels. Following the presentation, her book will be available for purchase. CCHA lectures are free and open to the public. The CCHA Museum is open Wednesday through Saturday from 10 a.m. to 3 p.m. For more information, visit www.clintoncountyhistorical.org or call 518-561-0340. Museum admission is free and donations are accepted.